Results are in 2011 DIVAS GLAM Awards!! THE 2011 DIVAS GLAM AWARDS are in via Brian Queen! The Court is an organization that helps those in needs with services to HIV/AIDS person(s), cancer and etc! Please become a member of the Court today! Contact Shanice McCoy-Patton or Dennis deClaire on Facebook! Angel is the owner of the Yadda Club located in Covington, KY. She has been involved in varies of fundraising and has accept the position to organize the Northern Kentucky Pride Festival along with Mykey Hess! Angel is a fabulous human-being., catch her at Yadda bartending! Fatty Pattys is wonderful place for lunch, dinner or late night! Ask for Mark, the owner. He will guide you through the menu and try one of their famous Milkshakes! Harlee Rainz is the daughter of Tyese Rainz. Can you find Harlee in Dayton at Club Masque on Mondays and varies of other venues throughout the Cincinnati area such as Roxys and Bar Monet. The Yadda Club has under-gone major revocations to the front bar as well as to the stage/dance area! It is now a relaxin, inviting and fabulous atmosphere! Go to the Yadda Club on Wednesday Nights to witness of the best shows in the area, hosted by Nikki Dimon. Thursdays is $10 Unlimited Drinks (wells/drafts) with DJ Julie J for Karaoke and a variety of things going on throughout the weekends! Check them out! The DJ for the Dock Complex in Cincinnati, OH is DJ Michael Johnson. Check out his experience and talent as he knocks your dancin' socks off! You can dance at the Dock on the weekends till 4am!! 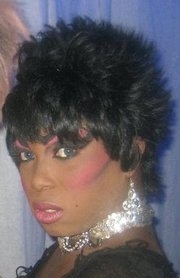 Shafreaka is on cast at the Cabaret along side with Penny Traition, Jessica Dimon and Monica Paige St. James. She is the former show director for the Yadda Club based in Covington, KY.
You can catch Sutle at Club BronZ on the weekends especially on Sunday for the Pride of Northside Show hosted by Savannah Judd. Sutle is an amazing DJ and I wish him nothin' but continuous success! Mary is the owner of Roxys Restaurant & Lounge located in downtown Cincinnati OH. Will has been karaok(ing) for a while in the area! The absolute BEST in my book! You can catch Will at Roxys Restaurant & Lounge on Tuesday nights and varies of other venues thoughout the week. 4U is located in downtown Cincinnati OH and has all your latest styles and fashions whether it is for business, casual or a night out on the town.. They also always have something for the queens. Check them out! Ask for Gio or Andy! I am proud to announce the winner, GIOVANNI LIVES for the 2011 DIVAS GLAM Award for Best Area Entertainer: Drag King.